Review of: Drills! Drills! Drills! This is not a dance DVD. By that, I mean - don't expect to dance your way through this - it's exercise, and it's hard work! These drills are designed to improve your skill in isolations and body awareness: they're not necessarily moves you will ever use in a choreography. And in that (IMO) lies their strength. 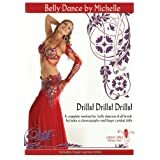 When I started learning belly dance, I was struck by how little muscle training was done in a typical belly dance class. In many other dance styles (ballet, contemporary, jazz, flamenco, even Tribal), students spend a large percentage of class time doing exercises not as dance moves in their own right, but as preparation to enable them to do dance moves better - whereas in many belly dance classes, you're dancing as soon as the class begins. That may feel great, but I always felt it meant I was missing the opportunity to focus on making sure my body was doing the best it could do. This DVD provides the opportunity to rectify that, by working through the exercises at home. It's not glamorous but if you're moving up to intermediate and want to develop your skills, you'll find it helpful.